If you are considering improving the appearance of your teeth, there are some teeth whitening consultation questions you should ask a dentist. The answers to these questions will make it easier for you to decide what type of treatment will be best for you. There may be some time before you make it to the dentist, so we have answered some of these questions. A small percentage of patients experience increased tooth sensitivity during and after the treatment. That said, this normally goes away after a few days. Patients should avoid cold or hot foods for about 48 hours after a whitening treatment. Yes. Teeth whitening treatments are very effective, especially when you a dentist carries it out. It is one of the most commonly performed cosmetic procedures. Most dentists have a great deal of experience whitening teeth. How long before does each session take? A typical teeth whitening session can last anywhere between one to two hours. Patients can expect their teeth to become up to 10 shades whiter after a single treatment. Depending on the severity of the stains and discoloration, you may need follow-up treatments. Is there a difference between professional teeth whitening and using over-the-counter whiteners? Here is one of the more common teeth whitening consultation questions. The answer is yes; there are many differences between the two. For starters, dentists use stronger bleaching agents, and that leads to improved results. Also, dentists make customized mouth trays for each patient when performing in-office whitening treatments. Over-the-counter products use a boil-and-use mouth tray that does not always fit. 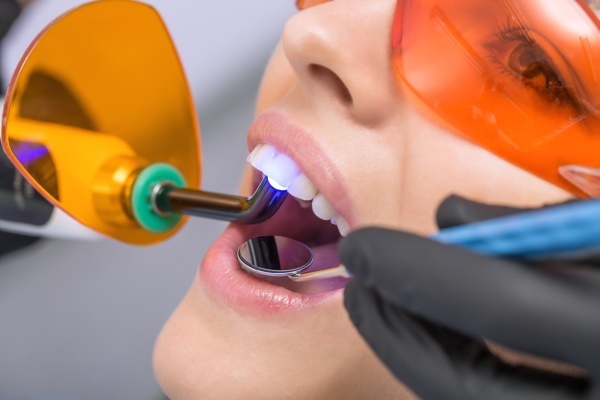 That makes in-office treatments safer since it is less likely that the bleaching agent will seep into the patient's gums and cause irritation. Who is eligible for professional teeth whitening treatments? People who have dental issues like cavities and tooth decay should speak with their dentist before whitening. The dentist will examine the patient before proceeding with the treatment to ensure there are no issues that could cause harmful side-effects. Does it cause damage to teeth? A teeth whitening treatment should not cause any damage to your teeth when done by a dentist. The results of teeth whitening treatments can last indefinitely if you practice good oral hygiene and see the dentist. Since most people expose their teeth to things that can stain or discolor them, you should speak with your dentist about maintenance treatments. Ready to start whitening treatment? The first thing you should do is schedule an appointment with a dentist. They will determine if your teeth are healthy enough, what type of results you should expect and come up with a treatment schedule. Most types of stains and discoloration can be removed with professional whitening treatments. There is no need to settle with stained and discolored teeth. If you do not have a regular dentist, call us to schedule an appointment. We can answer any of your teeth whitening consultation questions. Request an appointment here: https://drcalldental.com or call Dr. Call Dental Center at (706) 425-6240 for an appointment in our Dalton office. « When Should Tonsils Be Removed?